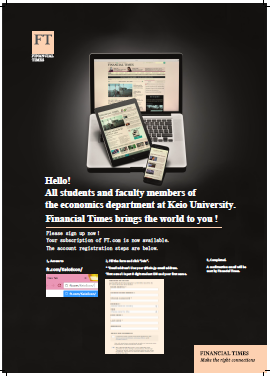 From September 2017, full-time students and faculty members of the Faculty of Economics and the Graduate School of Economics can subscribe to Financial Times digital (FT.com) for free. and fill in the registration form. FT.com is available upon receiving a confirmation email. Registration requires your @keio.jp email address. Students must enter their student ID number and first name in the “First name” area (faculty members are exempted).